Or, Can Laudrup Dodge the Sophomore Slump? Facing Liverpool on Monday, Swansea City are smack in the middle of the kind of opening fixtures that David Moyes was complaining about. Though Swansea has played well in all three games this September, they will be lucky to improve much on their current 16th place position (as of the weekend’s start) before the start of November, with Liverpool and Arsenal to either side of a more forgiving trip to Crystal Palace. Add in Europa League football that will now continue at least through the group stage, and it seems entirely possible that, despite excellent form at the moment, Swansea may struggle to repeat last season’s 9th place finish. Even so, Swansea has a lot going for them. Since 2007, Swansea has been coached by Roberto Martinez, Brendan Rodgers, and now Michael Laudrup. Since 2004-05 they have moved from League Two to the Premier League and qualified for European play . Clearly, they are a well-run club that appears to be moving from strength to strength. Though they have a tough start and are facing new challenges, it is hard to imagine Swansea in a serious relegation scrap. 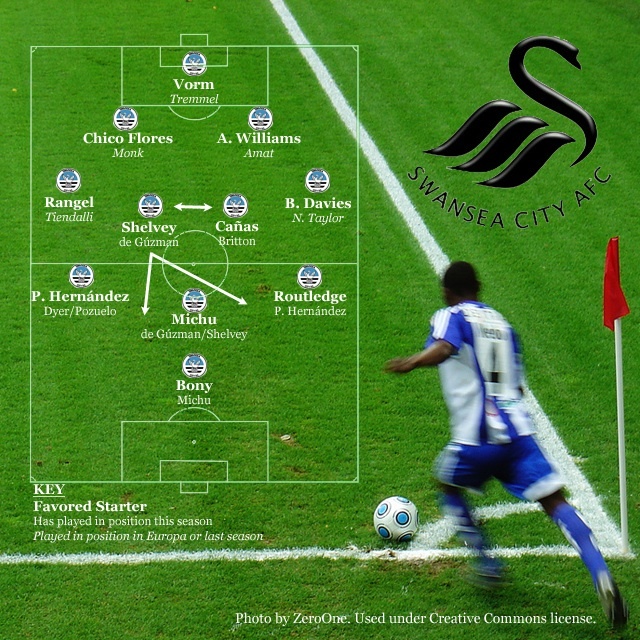 Swansea’s 4-2-3-1 predates Laudrup, having been the permanent formation under Rodgers as well (because his team was particularly devoted to ball retention, often in relatively deep positions, Rodgers’s squad was often deemed, not incorrectly, a 4-5-1; but the midfield was still clearly organized along the same lines). Last season, Laudrup was praised for bringing a directness and attacking intent to Swansea’s possession-based style that had been lacking under Rodgers (stylistically, a move from Barcelona to Bayern Munich). But even as he made the team his own last year, Laudrup’s changes at the start of this season show how he is continuing a process of gradual evolution. Though Laudrup has brought in some new starters, he has also ensured that his squad has coverage across the field, and his early Europa line-ups suggest that he will make use of the relative depth he has developed. Still, a fairly clear starting XI have emerged, and it will be interesting to see, especially entering into the group stages of the Europa, whether Laudrup will continue to field a large number of secondary players or will start to use his favored XI in that competition as well. It’s also worth noting that, in the latter stages of the West Brom game, Swansea shifted toward a 4-3-3, with Jonjo Shelvey moving up alongside Michu and leaving José Alberto Cañas alone in the holding role. The formation became even more pronounced when Jonathan de Guzman replaced Wilfired Bony (Michu moving into Bony’s striking role). Though 4-2-3-1 can easily slide into an attacking 4-3-3, it will be interesting to see, as Swansea starts to face lesser opposition, if Laudrup is hoping to move Swansea more toward this formation. While the most notable change at Swansea City this season is their garish new away strip, Laudrup has made several important additions to his 2012-13 side. His back five, however, remain firmly in place from the end of last season. In addition, last year’s super signing, Michu, is a guaranteed starter when healthy, either in the creative hole or up top in the striking role that he inhabited for most of last season. The arrival of Wilfried Bony, who scored 31 goals in 30 appearances for Eredivisie side Vitesse last season, means that Michu will predominantly start in his favored midfield role. But while Bony is the headline-catching addition, José Alberto Cañas is the most important addition to Laudrup’s squad and, like Michu and the back five, will feature in every game when available. Cañas perfectly captures the evolutionary relationship between Rodgers’s and Laudrup’s Swansea sides. The heart and soul of Rodgers’s side was Leon Britton, a West Ham Academy product who, for a reasonable part of 2011-12, actually had better passing statisitics than Xavi. I should say up front that I am the kind of fan who thinks that Xavi, rather than Messi or Ronaldo, is the most important player of his generation and who has rarely seen a sidways pass he didn’t like. My facebook page once proclaimed my man crush on Leon Britton with the blurb: “Europe’s top passing stats – Xavi’s unibrow = hello, kitten.” So it didn’t take me long to notice that Laudrup didn’t entirely share my affection. Laudrup continued to play Britton, but first Jonathan de Guzman and eventually Ki Sung-Yueng–just shipped on loan to Sunderland–came to take up more critical roles in Laudrup’s midfield. This meant that when Britton did play, he was increasing utilized in a solely defensive role rather than serving as a deep-lying nexus of the team’s offense. While Britton’s particular genius, a hot house flower under the best of circumstances, probably couldn’t fully function in a team playing to Laudrup’s model, the arrival of Cañas shows that Laudrup nonetheless understands what his team misses without Britton (as does the fact that it is Ki rather than Britton who has gone out on loan). Though younger, more mobile, and at least in comparison to Britton more physical, Cañas is pretty clearly Laudrup’s replacement for Rodgers’s central man. Cañas has been the top passer (for either team) in all three of Swansea’s opening games, with 216 of 235 passes completed (in fairness, Shelvey tied him in the last game against West Brom, though all but one of his six misplaced passes were in the more tightly contested first half, where Cañas missed only three). That’s a 92% pass completion rate. Cañas is the new Britton. A slightly higher tempo metronome to drive Swansea’s engine. Interestingly, Jonjo Shelvey appears to have taken the main role alongside Cañas. I might have expected this role to fall to Jonathan de Guzman, who played both in one of the two holding positions and as the central attacking midfielder behind Michu last season. This is an interesting decision, as Shelvey is a less reliable passer than de Guzman. Admittedly against difficult competition, Shelvey was completing only 75% of his passes before the game against West Brom. What he seems to offer in return is a big, athletic body. Indeed, in the game against Tottenham, Shelvey started out in the middle of the attack behind Michu (with Bony on the bench), but quickly swapped roles with de Guzman, who had started in a holding role alongside Cañas. This deeper role allowed him to body up against Paulinho and offer a bit more steel to the midfield, with de Guzman freed up for a more attacking role. It’s worth noting, however, that the two players continued to swap roles as the game continued. This fluidity of roles again points toward the desire to move between 4-2-3-1 and 4-3-3. In this regard, perhaps the most important quality that Cañas brings in comparison to Britton is the ability to serve as the sole holding midfielder in a 4-3-3. Ultimately, the roles of both Shelvey and de Guzman will probably be to play between these two formations, providing some defensive cover while also contributing to attack. De Guzman and Ki both worked in this sort of transitional role last year, so the addition of Shelvey may have been what led to the Korean’s loan move. The wings are fairly set. Wayne Routledge, a player from the Rodgers era, looks like the primary starter on the left, while Pablo Hernandez tends to start on the right. Alejandro Pozuelo has subbed on in two of the three games, and could eventually find himself in a starting role. He has thus far been even more positionally fluid than Hernandez, coming inside at every opportunity. It will be interesting to see how his role in the team develops. Of the back five, only Chico Flores has been brought in by Laudrup, though Ben Davies got his first chance with the senior side under him. One obvious question is to what extent Laudrup is consistently working toward a 4-3-3. The West Brom game suggests that Swansea will probably shift toward this formation in game they are dominating; but the real question is whether they will seek to implement a 4-3-3 consistently from the outset. A related question has to do with Laudrup’s goal in developing a deeper squad. It’s not clear to what extent the added depth is simply for cover (especially given European commitments), and to what extent Laudrup’s chooses his starting XI to tactically counter his opposition. Another trend worth noting is that, in addition to directness, Laudrup has consistently moved to increase Swansea’s physicality. Bony and Shelvey in particular, bring an added muscle to the side, and even Cañas (in comparison to Britton) contributes a stronger presence. Thus far in the season, Laudrup seems to be seeking a more physical edge to compliment his side’s effective passing. The rub will come later in the season, and it may be that a lack of rotation in the early going will contribute to a dip in form later. In both of their previous seasons, Swansea has had a considerable fall-off at the end of the season. Whether this was fatigue, an unconscious release once safety had been attained, or a conscious plan not waste energy on a season for all practical purposes over isn’t clear. But with added fixtures and a tough two opening months, Swansea may well need to keep winning in April and May if they want to keep pace with previous successes.